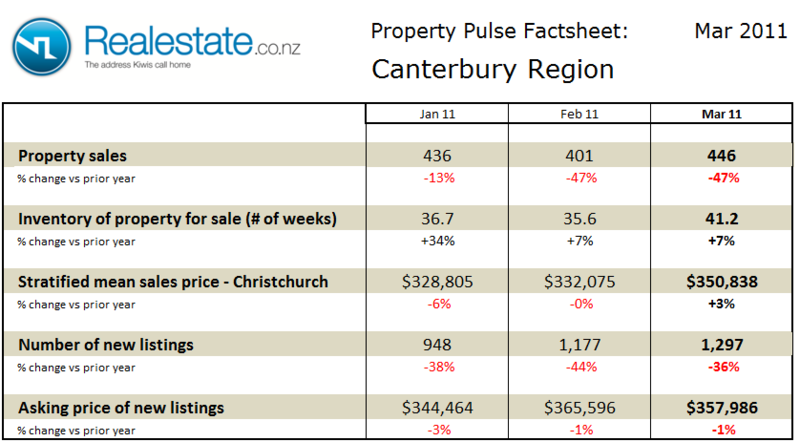 The Canterbury region property pulse factsheet for July 2012 is published using data from Realestate.co.nz and REINZ (Real Estate Institute of NZ). 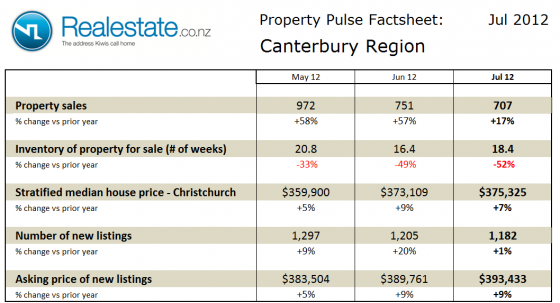 Property sales across the Canterbury region at 707 fell in the month on a seasonally adjusted basis, it was however up 17% up as compared to a year ago. The inventory of unsold houses on the market eased slightly in July having been as low as 16 weeks recently. The July level of 18 weeks of equivalent sales still remains significantly below the long-term average of 32 weeks. The stratified mean sales price for properties sold in Christchurch at $375,325 was up 7% as compared to a year ago, and up from the prior month. There has certainly been a strengthening of prices through all of 2012 in the region as inventory and listings have dropped. The asking price expectation of new listings was up by 9% as compared to a year ago at $393,433, this takes the asking price and selling price to new record levels. The level of new listings coming onto the market in July at 1,182 was down on the prior month and up just 1% as compared to a year ago. 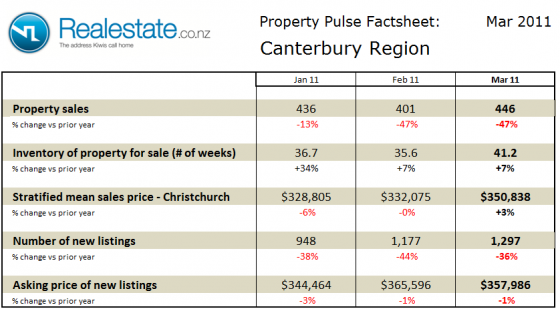 This data indicates that the Canterbury market continues to experience a very strong seller’s market. Availability of property is tight and demand remains strong resulting in the rising prices for properties. The trend is likely to continue as new listings are not matching the pace of sales. 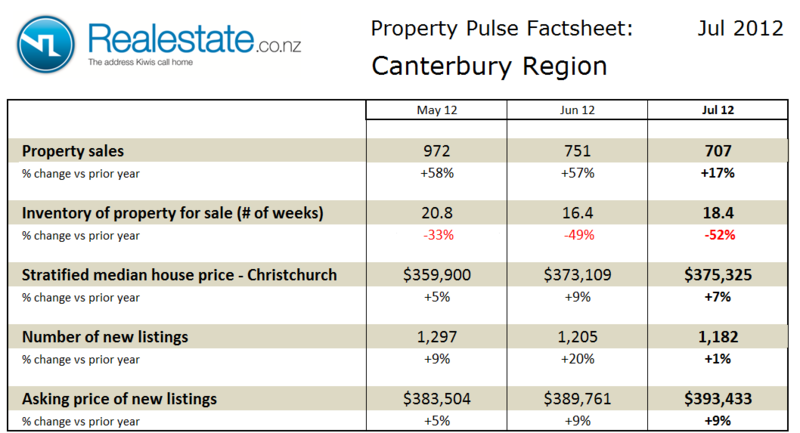 The Canterbury region property pulse factsheet for June 2012 is published using data from Realestate.co.nz and REINZ (Real Estate Institute of NZ). Property sales across the Canterbury region at 751 fell significantly in the month on a seasonally adjusted basis, it was however up 57% up as compared to a year ago. The inventory of unsold houses on the market fell further to just 16 weeks, well below the long-term average of 32 weeks of equivalent sales. This continues to demonstrate the shortage in the region and certainly favours sellers in the market. The stratified mean sales price for properties sold in Christchurch at $373,109 was up 9% as compared to a year ago, and up from the prior month. There has certainly been a strengthening of prices through all of 2012 in the region as inventory and listings have dropped. The asking price expectation of new listings was up by 9% as compared to a year ago at $389,761. The level of new listings coming onto the market in June at 1,205 was in line with the prior month and 20% up as compared to a year ago. 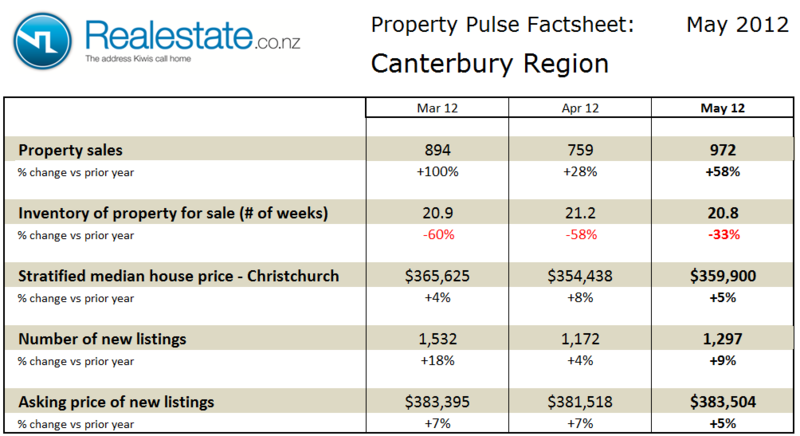 The Canterbury region property pulse factsheet for May 2012 is published using data from Realestate.co.nz and REINZ (Real Estate Institute of NZ). 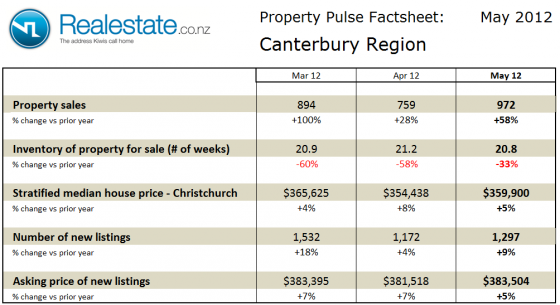 Property sales across the Canterbury region at 972 rose very sharply in the month on a seasonally adjusted basis in May, it was also 58% up as compared to a year ago. The inventory of unsold houses on the market fell further to just 21 weeks, well below the long-term average of 32 weeks of equivalent sales. This continues to demonstrate the shortage in the region and certainly favours sellers in the market. The stratified mean sales price for properties sold in Christchurch at $359,900 was up 5% as compared to a year ago, and up from the prior month. There has certainly been a strengthening of prices through all of 2012 in the region as inventory and listings have dropped. The asking price expectation of new listings was up by 5% as compared to a year ago at $383,504. The level of new listings coming onto the market in May at 1,297 was well up on prior month and 9% up as compared to a year ago. The Canterbury region property pulse factsheet for November 2011 is published using data from Realestate.co.nz and REINZ (Real Estate Institute of NZ). 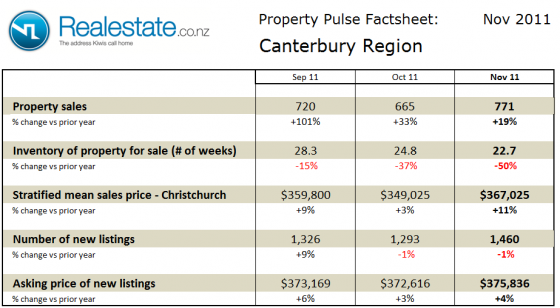 Property sales across the Canterbury region at 771 rose in the month on a seasonally adjusted basis in November, but were up a significant 19% as compared to a year ago. The inventory of unsold houses on the market fell further to just 23 weeks, well below the long-term average of 33 weeks of equivalent sales. This signifies a significant shortage in the region and certainly favours sellers in the market. The stratified mean sales price for properties sold in Christchurch at $367,025 was up 11% as compared to a year ago, and up from the prior month. There has certainly been a strengthening of prices through all of 2011 in the region as inventory and listings have dropped. The asking price expectation of new listings was up by 4% as compared to a year ago at $375,836. The level of new listings coming onto the market in November at 1,460 was well up on prior month but down 1% as compared to a year ago. 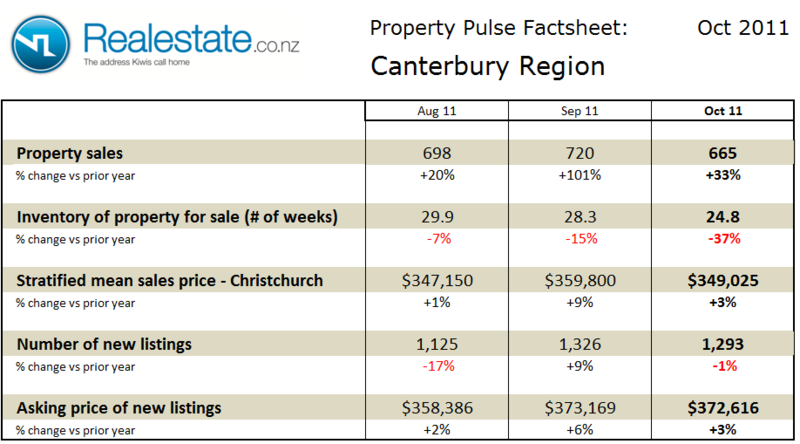 The Canterbury region property pulse factsheet for October 2011 is published using data from Realestate.co.nz and REINZ (Real Estate Institute of NZ). Property sales across the Canterbury region at 665 fell in the month on a seasonally adjusted basis in October, but were up a significant 33% as compared to a year ago. The inventory of unsold houses on the market fell further to 25 weeks, well below the long-term average of 33 weeks of equivalent sales. The stratified mean sales price for properties sold in Christchurch at $349,025 was up 3% as compared to a year ago, but down from the prior month. The asking price expectation of new listings was up by 3% as compared to a year ago at $372,616. The level of new listings coming onto the market in October at 1,293 was down on prior month and down 1% as compared to a year ago. 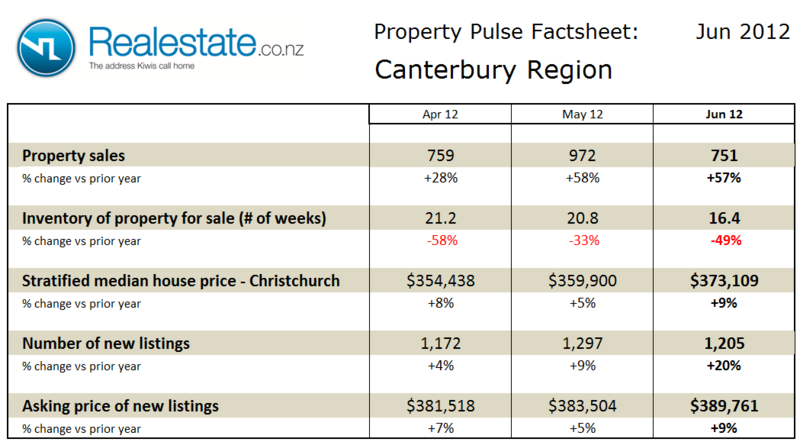 The Canterbury region property pulse factsheet for May 2011 is published using data from Realestate.co.nz and REINZ (Real Estate Institute of NZ). 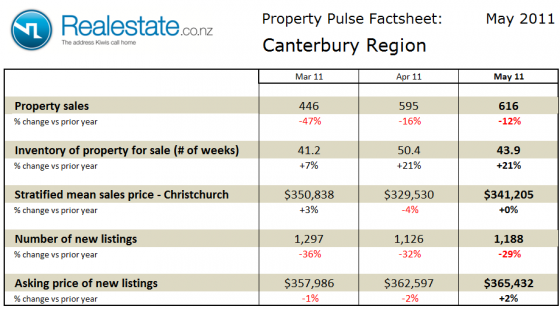 Property sales across the Canterbury region at 616 fell very slightly in the month on a seasonally adjusted basis in May and were down 12% as compared to a year ago. This clearly shows the devastating impact of the February earthquake on the city of Christchurch and the wider Canterbury region. The inventory of unsold houses on the market fell to 44 weeks to remain above the long-term average of 33 weeks of equivalent sales. The stratified mean sales price for properties sold in Christchurch at $341,205 was unchanged from a year ago but up from the prior month. The asking price expectation of new listings was up slightly by 2% as compared to a year ago at $365,432. The level of new listings coming onto the market in May at 1,188 was up slightly on prior month and down a significant 29% as compared to a year ago. 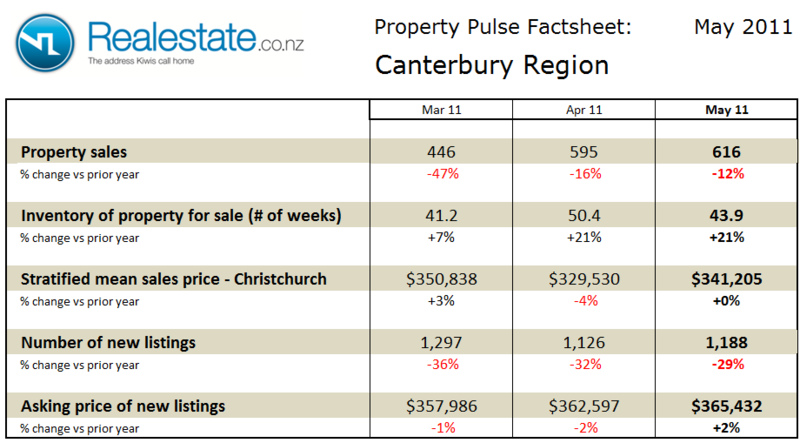 The Canterbury region property pulse factsheet for April 2011 is published using data from Realestate.co.nz and REINZ (Real Estate Institute of NZ). 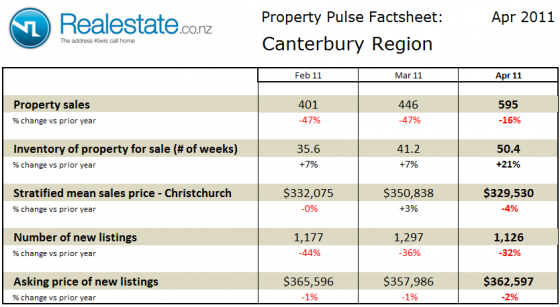 Property sales across the Canterbury region at 595 rose significantly in the month on a seasonally adjusted basis in April and were down a 16% as compared to a year ago. This clearly shows the devastating impact of the February earthquake on the city of Christchurch and the wider Canterbury region. The inventory of unsold houses on the market rose again to 50 weeks to remain above the long-term average of 33 weeks of equivalent sales. The stratified mean sales price for properties sold in Christchurch at $329,530 was down 4% as compared to a year ago and down from the prior month. The asking price expectation of new listings was down slightly by 2% as compared to a year ago at $362,597. The level of new listings coming onto the market in April at 1,126 was again down on prior month and down a significant 32% as compared to a year ago. 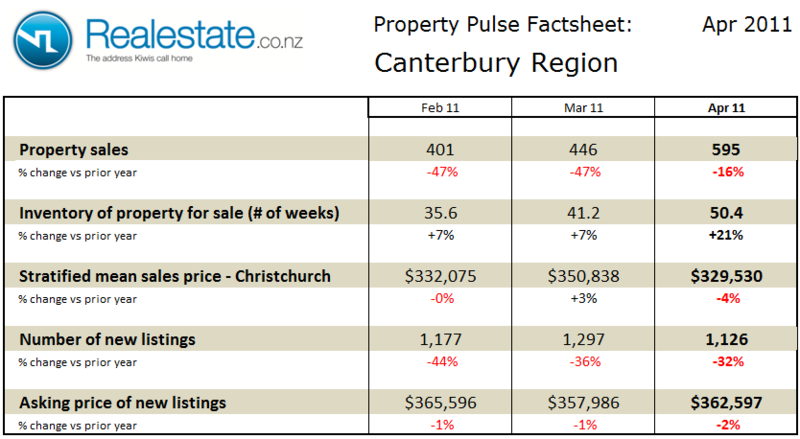 The Canterbury region property pulse factsheet for March 2011 is published using data from Realestate.co.nz and REINZ (Real Estate Institute of NZ). Property sales at 446 in the month fell significantly on a seasonally adjusted basis in March and were down a very significant 47% as compared to a year ago. This clearly shows the devastating impact of the February earthquake on the city of Christchurch and the wider Canterbury region. The inventory of unsold houses rose again to remain above the long-term average at 41 weeks of equivalent sales. The stratified mean sales price at $350,838 was up 3% as compared to a year ago and up from the prior month. The asking price expectation of new listings was down slightly by 1% as compared to a year ago at $357,986. The level of new listings coming onto the market in March at 1,297 was up slightly as compared to February but down a significant 36% as compared to a year ago. The Canterbury region Property Market factsheet for October 2010 can be downloaded by clicking this icon. Property prices based on the stratified pricing model for Christchurch fell sharply in September to $330,750 from $349,595 in June. Compared to September 2009 prices are down 5.5%. Across the Canterbury region the impact of the earthquake impacted sales. There were 359 sales in September as compared to 584 in August. Inventory of houses on the market remained flat in September at 33 weeks of equivalent sales; this figure is close to the long term average in the region of 31 weeks. In overall terms the property market across the Canterbury region is fairly well balanced between buyers and sellers, however the circumstances across the region over the coming months will be heavily influenced by the after effects of the earthquake. The Canterbury region Property Market factsheet for August 2010 can be downloaded by clicking this icon. Property prices based on the stratified pricing model for Christchurch rose in July to $351,375 from $349,595 in June. Compared to July 2009 prices are up 7.4%. Across the Canterbury region property sales remain flat on a seasonally adjusted basis with no movement between June and July. There were 651 sales in July as compared to 674 in June. On a moving annual basis sales are down very slightly by 1.8% in the past year 9,028 properties have been sold as compared to 9,196 in the prior 12 months. Inventory of houses on the market remained flat in July at 35 weeks of equivalent sales; this figure is close to the long term average in the region of 31 weeks. 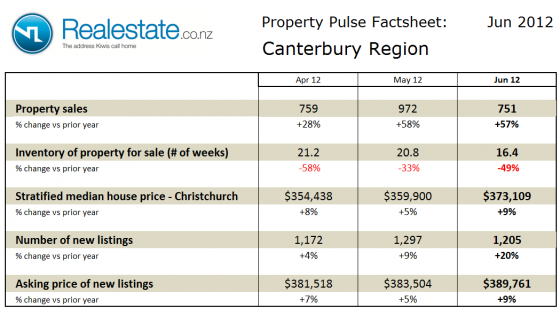 In overall terms the property market across the Canterbury region is fairly well balanced between buyers and sellers.